In keeping with the restoration process that we discussed in the introduction of this series, let's notice three sets of examples drawn directly out of Scripture. For emphasis sake, let's begin at the end. Let's first notice the resulting practices of those who followed the teachings of Christ. Below is a list of conversion stories in the book of Acts. Please take time to read each and make note of the common factor that connects all of them - baptism. Conclusion: When one approaches this inspired historical record with sincere objectivity, a single fact becomes rapidly apparent. Regardless of what happened to the thief on the cross, once the Church Age began, the inspired leaders insisted that baptism was urgent and necessary for the forgiveness of sins. For a full contextual appreciation of this subject, it is important to know that baptism was being practiced long before Jesus began His earthly ministry. Even before His forerunner, John the Baptist, the Jews had been using baptism in the conversion process of proselyte to Judaism. However, as John the Baptist came on the scene, the biblical record became inundated with examples of people experiencing baptism for repentance and forgiveness of sins (Mark 1:4). Q: Why is this important to our discussion of the thief on the cross? 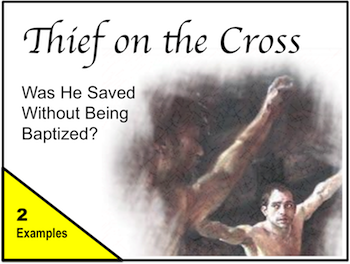 A: The most common assumption made about the thief is that he was not baptized. Those who do not seek a full restoration of Christian doctrine have planted this in our minds. Given the passages below and the historical context mentioned before, the assumption that the thief on the cross was probably not baptized lacks foundation. Conclusion: It is very dangerous to believe that salvation comes without baptism simply because it is assumed that the thief on the cross was not baptized. Given the masses of people being baptized in the verses above, the thief could have easily been one of them. Do we know this for sure? No. But it seems just as certain that he could have been baptized as it does otherwise. Not only was baptism being preached long before John the Baptist then greatly emphasized during the prolific ministry of John THE BAPTIST, Jesus took those amazing statistics of baptisms and expanded them to an even greater level. Notice the statistical implications of the following verse. Implication: According to the biblical record, John baptized "The whole Judean countryside and all the people of Jerusalem" (Mark 1:5, NIV). Then Jesus came along and it was rumored that He "baptized more disciples than John"! The probability of the thief being baptized by John or Jesus or one of their disciples is obviously quite significant. Certainly, the probability is significant enough to discredit the misleading assumption that the thief was never baptized. The answer of this important question, "But what about the thief on the cross?" will anchor itself to three biblical principles: Examples, Exceptions, and Excuses. Next time, we will look at exceptions. This is where the subject begins to take on practical, real-time application to our present age. Please join us then! The Thief on the Cross: "Exceptions"